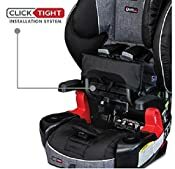 Typically up to 75 percent of car seats are installed incorrectly, but our revolutionary ClickTight Installation System is the safest and simplest technology on the market. Just open the front of the car seat, buckle the seat belt across and click the seat shut. That's all you need to do for rock-solid installation - the seat won't budge and you can travel worry-free with your child. Britax is the only child car seat brand that features world-class SafeCell Impact Protection. This integrated system of safety components provides unmatched protection for your child. These features include a steel frame, energy-absorbing base, V-shaped tether to minimize seat rotation and staged-release stitches that slow and reduce forward movement during a crash. Side impacts represent 25 percent of collisions and result in the most severe injuries. We designed the Frontier ClickTight with not 1, but 2, strong layers of side energy absorption. A deep foam-lined shell and quick-adjust head protection shield your child from side impacts. Harness-2-booster seats play double duty by offering 2 seating modes. Harness mode is for holding smaller children starting at 25 lbs and up to 90 lbs. Then the seat can transition into a traditional booster once your big kid is ready. These transitions are easy and don't require you to unthread the harness. Simply tuck the straps into the interior of the seat. We developed the Frontier ClickTight to safely and comfortably hold your child from preschool through the elementary school years. The easy-adjust harness grows along with your child with 9 different positions. Change the height of the seat with just the push of a button - no inconvenient rethreading necessary. And the plush fabrics and multi-position recline allow your child to relax in comfort. The ClickTight Installation System gives you the safest and easiest installation every time so you can be certain your loved one is safe. Safeguards your child with an extra layer of side impact protection, an impact-absorbing base and steel frame. Easily adjusts with the push of a button - no need to rethread the harness. Wraps your child in comfort with premium padding and fabrics. 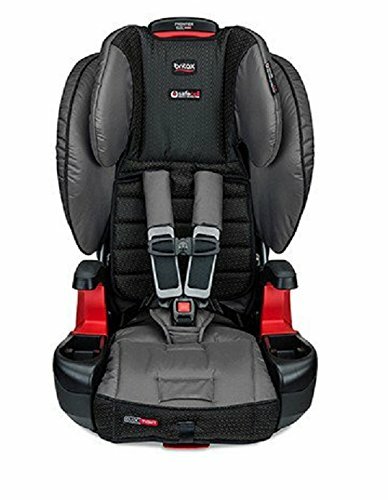 Includes car seat and removable harness padding.